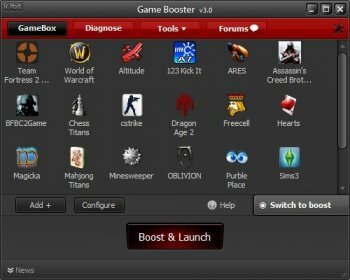 Iobit Game Booster is designed to help optimize your PC for smoother, more responsive game play in the latest PC games with the touch of a button. It helps achieve the performance edge previously only available to highly technical enthusiasts. It works by temporarily shutting down background processes, cleaning RAM, and intensifying processor performance. That means you can keep all the features of Microsoft Windows 7, Vista and XP ready for when you need them, but turn them off when you are ready to get down to serious business - gaming. Game Booster makes it simpler to enjoy the latest games and take your experience to a new level. Useless piece of software, it won´t make your games run faster, only a newer PC will do that. Beware of these fake reviewers selling snake oil. It can automatically detect and close the useless services, and more system resources will be devoted to the game. Smoother play and image display. This is my favourite utility for game playing. I like playing games very much. Using this program to launch fast and more responsive game play, I had wonderful game experience. I used to pay for Game Booster, but now version 3 is free for all users. Very nice. Their products and service are good. Nothing to complain about them. I had the best gaming experience, even on my old PC with one-click to boost PC performance. Is it me or do the reviews look fake? Game Defrag is one occasionally technology in Game Booster fact that systematically makes game of launching faster and game of playing any more alive. Wonderful. Game Booster automatically unconsciously detect and next door any more excessive upbringing services, therefore any more well system unlimited resources after free up a will of steel be extremely dedicated unusually to alive game of playing and spotless image maximum displaying.